TS Network DataServer gives you the ability to share files and/or programs over a network moving much of the logic required for distributed I/O to the system that either contains the data or processes the data. This greatly minimizes network exchanges, providing improved performance. Thoroughbred's TS Network DataServer is a key component to the Thoroughbred network solution. Any Thoroughbred-based application including those developed in Thoroughbred Basic, Dictionary-IV or OPENworkshop® can use the TS Network DataServer to enhance the reliability and performance of a network. Complex, transaction oriented, mission critical applications such as accounting, distribution and manufacturing can require many network accesses, 30 to 40 in some applications, just to process one data transaction. TS Network DataServer places the file handling logic on the server, rather than the workstation. As a result, the large amount of communications usually associated with key access and record locking are moved off the network and Client workstation to the Server. The benefits achieved with the TS Network DataServer include increased system performance and improved data integrity. TS Network DataServer supports Windows, Linux and UNIX server-based network configurations. Server configurations can be set up to support direct host configurations communicating with the systems Workstations. 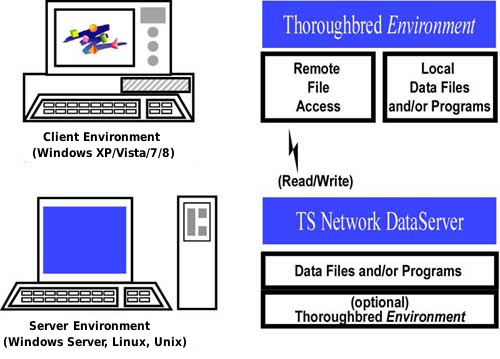 TS Network DataServer can be added to an existing Thoroughbred-based network system, requiring access to networked Workstations. Windows - Thoroughbred TBPVIEW.EXE produces a listing of server processes currently running. Linux/UNIX - ps command, will produce a listing of server processes currently running. Network performance and data integrity are highly dependent on how the network is setup and how the server and workstation hardware and software is configured. Call your Thoroughbred representative for more information.